Okay now let me confess that along with bikes.............I also keep on the look for cars, every kind of cars, compacts, sedans, salons and exotics!!! But of late my indulgance with cars is more due to the fact that, after returning from US, I'm very seriously thinking of buying a car (and that's solely due to family reasons). So, I keep on looking through the forest and try to analyze every wild weed I come across. 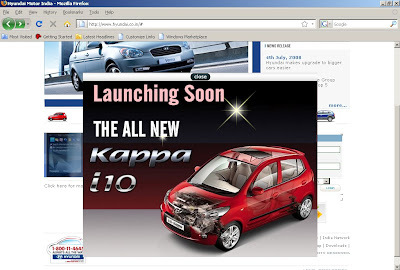 So, today I was going through Hyundai's India site when a flash ad caught my attention!! Basically Hyundai is actually trying to upgrade the engine capacity of the car by an addition .1L, i.e. a 1.2L variant of the existing i10, producing an addition 15bhp over and above the 66.7bhp as produced by the current i10. The new engine, code named Kappa is being produced in full swing in the company's Chennai plant and Hyndai is looking forward to it's release in a couple of months. Now that should be exciting. If somebody asks me I would say it's a well directed aggressive move by Hyndai, which is anticipating a hit by the soon to be launched Maruti Suzuki Splash, which also would be available in 1.1L and 1.2L petrol vairants and a 1.3L deisel variant. Also, in an attempt to suite the ramifications of the decisions taken by our beloved Finance Minister, the company is also planning to launch a LPG driven variant of the Santro by August this year. No doubt Chevrolet Spark is a great car in this category and I researched about that one too..... but it's a bit too cute looking for me :). Apart from that, it's spares and maintenance are a bit more than the Hyndai and Maruti. Thanks a lot for leaving your comments. Chevrolet Spark is attractive, distinctively shaped front headlights and round tail lights define its unique character in short a cute looking family car and loaded with all necessary features.